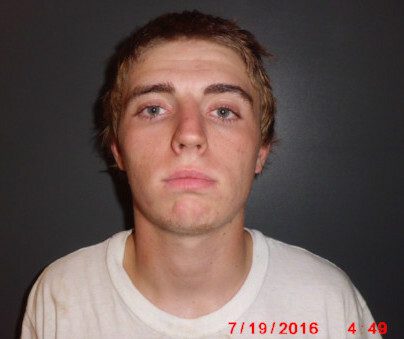 Dakota Hack, 20, of Rockport was sentenced on Friday afternoon in the Spencer Circuit Court after entering guilty pleas to a series of burglaries and auto thefts that occurred in the Rockport and Grandview areas in May and July of 2016. Hack has been in custody at the Spencer County Law Enforcement since his arrest in July 2016. The Rockport Police Department began investigating a burglary at Coyote Battery in Rockport in May of 2016. Based upon information received in the investigation, officers suspected involvement by Hack and located him for questioning. During questioning by Officers Kyle Maldonado and Dale Meredith, Hack admitted to being responsible for the break-in and confessed to a number of other burglaries and thefts of vehicles and ATV’s. Deputy David Hall of the Spencer County Sheriff’s Department was then contacted and he interviewed Hack and began investigating the other cases. Hack entered into a plea and sentencing agreement with the Spencer County Prosecutor’s Office on October 20, 2017 in which he entered guily pleas to one count of burglary as a Level 4 felony, three counts of burglary as Level 5 felonies, and three counts of auto theft as Level 6 felonies. Following entry of the pleas, a pre-sentence investigation report was ordered and a sentencing hearing was held on March 2. Under the agreement accepted by Circuit Court Judge, Jon Dartt, Hack received a sentence of 11 years executed at the Indiana Department of Correction. Upon good behavior there is a possibility of Hack’s sentence being modified to work release or other intensive monitoring to begin paying back restitution to the victims which is also ordered as part of the plea and sentencing agreement. Under Indiana law, offenders sentenced for Level 5 or higher felonies must serve at least 75% of their sentence and must serve at least 50% of a sentence for a Level 6 felony. “Anytime a person is victimized by a break-in to their home or business it not only causes financial harm, but often results in emotional distress because victims no longer feel secure in a place where they normally feel safe,” said Spencer County Prosecutor Dan Wilkinson. Wilkinson said that the cases warranted the 11 year executed sentence due to the number of serious offenses and due to Hack’s criminal and juvenile record. Because of Hack’s young age and the restitution owed to the victims, the potential modification upon good behavior to work release or other intensive monitoring was also appropriate to require the Defendant to work to pay back the losses he caused to the victims, Wilkinson said. Be the first to comment on "Man Sentenced for String of Burglaries and Auto Thefts in Southern Spencer County"